Are you a bit behind on getting ready for Thanksgiving? I have some resources to help you get a gluten and dairy free dinner on the table. First, is my packet from the 2008 Thanksgiving dinner class I taught. It includes a grocery list, make ahead instructions and a time line for making your dinner. All recipes are gluten and dairy free, with egg and corn free alternatives for each recipe. The post of my November 2005 class are all recipes that can be used for Thanksgiving. And for those of you who just gotta have it, here is Green Bean Casserole with Crispy Onions/Faux French’s. Woo-hoo! 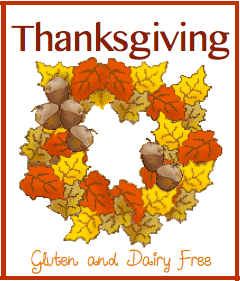 Gluten Free Goodness has a roundup AND a GF turkey list for 2011 in her newsletter. Woo!